In the time since, Ken has had several major brain surgeries and is still in intensive care in a Cleveland hospital facing a long recovery. The attacker, who had recently been released from prison after serving a long sentence for voluntary manslaughter, has been arrested and is being held on a 2 million dollar bail, awaiting sentencing for this heinous crime. 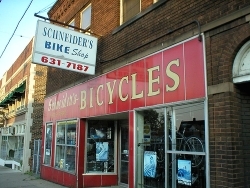 Schneider's Bike Shop is a generation's old bike shop that has been in business for several decades. Ken Schneider has always stocked a good selection of BMX and skateboard goods and is well known for his generosity, kindness and for just being a cool guy with a cool shop. A fund has been set up to aid the Schneider family during this incredibly difficult time. Several bike and skate companies are raising funds through various promotions as well. The response by the Cleveland community, as well as the extended bike and skateboard community, has been amazing, but the Schneider family still needs help for medical expenses, loss of income and the related costs of the aftermath of this tragic event. For one week, Props Visual, producer of Props BMX video magazine, will be donating 100% of the revenue (including the shipping) generated from the sale of it's latest release, the Road Fools 6/7 DVD set, starting Saturday, April 9th, 2006. Please go to www.propsvisual.com www.propsvisual.com to learn more. For further information about the Friends of Ken Schneider Fund, please go to www.deliveranceclothing.com. Also, for more information on Ken go here.